Are the benefits worth the cost of Amazon’s membership? Amazon Prime is a membership program offered by the website Amazon.com, the popular online retailer. Prime members receive discounted shipping (often free) and access to download or streaming services for music, video, books, audio books, and games. Amazon Prime Basics: How Much Does It Cost? Amazon’s Prime membership begins by signing up for a free 30-day trial, after which members pay either a discounted yearly fee or a regular monthly fee (currently $119 for the yearly membership, or $12.99 per month for monthly membership). There is also an Amazon Prime Student membership option for college students who have an email address that ends with .edu which costs about half the price of the standard Amazon Prime member ($6.49 per month or $59 per year, after a free six month trial). On the standard plan, during the 30-day trial, members have a chance to test out many of the features of the Prime membership including free two-day shipping and early access to Amazon Lightning Deals. Not all benefits of the paid Amazon Prime membership are available during the free trial, particularly for-fee add-on services and subscriptions. Paying for the membership grants access to the full set of services, benefits, features, and add-on options. So, what exactly does Amazon Prime include? The flagship feature and most-often mentioned benefit of an Amazon Prime membership are the savings on shipping. Free Two-Day Shipping: Members automatically get free two-day shipping on most items and orders. In cases where an item is not available for two-day shipping, it still ships free but may take a day or two longer. Free Same-Day Delivery: Members who live in an eligible zip code, typically those near an Amazon warehouse or fulfillment center, can opt for free same-day delivery of their order. Free Release-Date Delivery: Members who pre-order an eligible item ahead of the release date receive guaranteed delivery of the item on the actual release date. Prime Now: Members who live in select cities and zip codes where Prime Now service is available receive free delivery in two hours or less (or a specially selected delivery time, if preferred). Members can use this option for thousands of items, such as pet care needs, electronics, food, gifts, and even delivery from local area stores and restaurants. Use of Amazon Locker and Amazon Hub. This is a safe place to hold items when you don’t want packages left unattended at your home or office after they're delivered. The second most-mentioned benefit of the Amazon Prime membership are exclusive shopping benefits reserved for Prime members. Prime Early Access: Members get access to Amazon Lightning Deals 30 minutes before everyone else. Amazon Elements: Members get exclusive access to Amazon’s private line of everyday essential products, developed with a focus on top quality ingredients and full disclosure of ingredients used. Initial products include vitamin and mineral supplements and baby wipes, with additional products in development. Amazon Dash Button: Members can buy a variety of Dash buttons for the items they use most. Dash buttons are a quick and easy way for Prime members to place an order simply by pressing a button. Dash buttons are available for household cleaners, pet products, snacks, beverages, and health and beauty items. Amazon Prime members have free access to a number of audio services for music and audio books. Prime Music: Amazon’s streaming music service, Prime Music, is available for members ad-free and with unlimited access to more than a million songs, hundreds of Prime playlists, and self-created playlists. The service includes unlimited skips and members can download songs to the Amazon Music app to listen offline for free, however, the app doesn’t allow music to be exported elsewhere. Amazon has an additional music service called Music Unlimited that is a pay service, but Prime members receive a monthly discount towards its cost. Audible Channels for Prime: Members get free unlimited access to Audible Channels, featuring original audio series, playlists organized by topic of interest, and other audio content. Members also get free access to listen to best-selling titles, favorite classics, and family-focused audio books with Prime Exclusive Audiobooks. Prime members simply log into the Audible app with their Amazon Prime account to use these benefits. As the creator of the Kindle e-reader, it’s no surprise Amazon Prime members have exclusive benefits for those who love to read. Prime Reading: Prime members have exclusive access to the Prime Reading Catalog. Digitally borrow books, magazines, and more to read on Kindle devices, Fire tablets, Fire phone, or with the Kindle app for iOS and Android. Amazon First Reads: Members get pre-publication access to download one new free (or deeply discounted) book every month from the six monthly picks on Amazon First Read’s list. The Amazon First Reads program was previously called Kindle First. Kindle Owners’ Lending Library: Amazon Prime members can borrow one free book per month, readable on Kindle devices, Fire tablet, or Fire phone from the Kindle Owners' Lending Library. Members can “keep” a title as long as they want with no expiration, however, the service only allows you to borrow one book at a time so you need to return the current book before choosing a new title to borrow. This benefit is not available through the Kindle app for iPhone and Android. The Kindle Owner's Lending Library is only available for Amazon Prime members who also own a Kindle or Fire device and link their device to their Amazon Prime account. Amazon Prime members receive unlimited streaming of a large selection of TV shows and movies. Members can also purchase discounted subscriptions to premium channels and content. Prime Video: Members enjoy unlimited streaming service for TV shows and movies included in Prime Video. To find titles to watch, members just look for the Amazon Prime logo or “Watch now with Amazon Prime” in the video details. Titles available change periodically, however, members can create a watch list and the service will alert you when a title on your watch list is about to expire. Prime Video also includes Amazon Original Series. Video Add-On Subscriptions: Prime members can opt to purchase discounted subscriptions or movie rentals to add-on to their viewing options, including new releases and premium television channels, such as Starz and Showtime. Prime Photos: Prime members receive unlimited digital storage for all of their photos in Amazon Drive. Prime Photos also allows members to organize, search, and share photos. Twitch Prime: Members can link their Twitch.tv account with their Amazon Prime account for special discounts on pre-orders of physical games and new releases. Members also get ad-free viewing and a new free Twitch channel subscription each month. Twitch Prime grants access to exclusive free games and game content, as well. Everyone’s gotta eat, right? Members can use Amazon Prime services to eat cheaper or easier with delivery services. Include the new Whole Foods discounts for Prime members and eat healthier too. Prime Pantry: Members who live in eligible regions can shop for every day household needs and groceries and have their Pantry order delivered for an additional fee. Amazon Restaurants: In eligible zip codes, Prime members can order from popular area restaurants and have their meal delivered right to their door. AmazonFresh: AmazonFresh is a grocery delivery/pick-up add-on service option for Amazon Prime members. In select areas, members can pay an additional membership fee to receive free delivery on AmazonFresh orders over $50 or a flat delivery rate for orders under $50. Whole Foods Market Discounts: Amazon Prime members receive additional discounts on Whole Foods Market items they purchase through Prime Pantry, AmazonFresh, Prime Now, and the Amazon.com website. In the near future, Prime members will also receive special discounts when they shop in-store at Whole Foods Market locations. Whole Foods Market is a subsidiary of Amazon. Amazon Prime members are eligible for cash-back rewards and special discount programs on certain categories of items. Members can also share some benefits with other members of their household. Prime Rewards: Prime members earn 5 percent back on Amazon purchases made with their Amazon Prime Rewards Visa or Amazon Prime Store card. 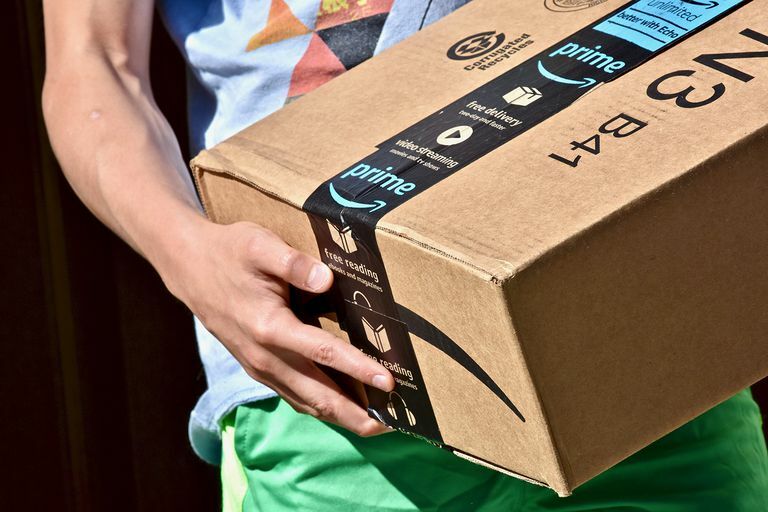 Prime members can instead opt to connect their checking account to a gift card through Amazon Prime Reload for 2 percent cash back. Amazon Family: Members can earn discounts on diapers, baby food, baby registry items, and other baby needs by signing up for Amazon Family’s Subscribe & Save program. Amazon Household: Members can share certain benefits with Amazon Household. Amazon Household allows two adult accounts, up to four teen profiles, and up to four child profiles. Family Library allows members to share Kindle books, games, apps, and audio books with their Amazon Household. Prime Day: Prime Day is a one-day mega sales event exclusively for Amazon Prime Members. Part Cyber-Monday-in-July, part thank you discount for Prime members, Prime Day features special deals, exclusive items, special Lightning Deals only for Prime members, and more. Amazon Prime Members can cancel at any time. However, if you have paid the discounted yearly rate and you have used any of your Prime member benefits, including free two-day shipping, you will not be eligible for a refund. If you are on the fence about how much you will use the various benefits of an Amazon Prime Membership, it may make sense to consider the monthly membership option instead of the yearly membership. To cancel your Amazon Prime Membership, log into the Amazon website and go to Your Account > Manage Prime Membership. When the Prime membership management page loads, click the End Membership link. The site will take you through a couple of pages to verify you really do want to cancel before your cancellation is processed. If you are cancelling during your initial 30-day trial of Amazon Prime, you would click the Do Not Continue link on the Prime membership management page to cancel your membership. How often do you shop at Whole Foods Market? With in-store discounts exclusively for Amazon Prime members on the horizon, savings on your every day purchases at your local Whole Foods store may soon offset the cost of the membership. How often do you buy or rent access to movies or TV shows through Amazon? Many movies and shows, including Amazon Originals can be streamed for free with your Prime membership. Two or three movies each month can easily offset the cost of a Prime membership. How often do you buy books or magazines to read on a Kindle or Fire device or your smartphone's Kindle app? Amazon Prime members have free access to a large catalog of books, magazines, audio books, comic books and more. For avid readers, a Prime membership may be less expensive than your typical monthly Kindle content purchases. Amazon offers a free 30-day trial of Amazon Prime so you can take it for a test-drive. If you feel it's not for you, simply cancel before your 30 days are up.